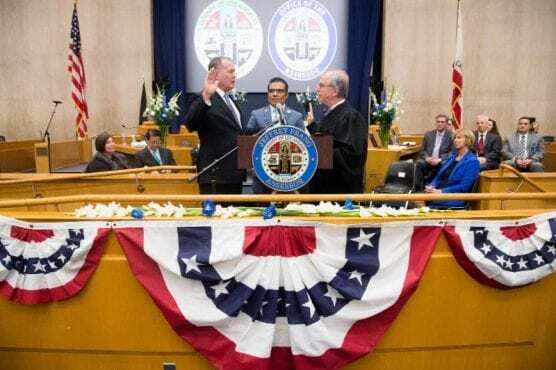 Assessor Jeffrey Prang was sworn in for a second term as the 27th Assessor of Los Angeles County before a crowd of more than 500 friends, family, officials and staff on Monday. In his remarks, Prang highlighted successes attained since taking the helm at the Assessor’s office four years ago, including technological modernization and lowering backlogs in new construction processing and assessment appeals. Prang’s also thanked his staff for their commitment to public service excellence and lauded this year’s record-breaking Assessment Roll value while noting simultaneous savings to a record number of veterans, homeowners, and non-profit organizations. “I am excited for what the next four years will hold as we complete the technological innovation of the Office, bring new vision to our public service, and continue to dedicate ourselves to the people of this county,” Prang said. The Oath of Office ceremony at the Kenneth Hahn Hall of Administration, emceed by former State Assemblymember Mike Eng, also included County Board of Supervisors Chair Janice Hahn, Superior Court Judge Dean Hansell, Rabbi Denise Eger, Abbe Land of the Women and Girls Initiative, and Grammy-nominated singer Jonathan Grier and the Tribe of Judah. “We have achieved many of the tasks we set for ourselves four years ago, demonstrating definitively that the Office of the Assessor is an agency of which both its employees and the public can be proud,” Prang said. “The oath I took today signifies my continued commitment to fulfill the pursuit of excellence in public service; to lead the way so that others may follow; and to improve the quality of life for all families in the county,” he said.